Does a concert Elektra dance? Does she stash her axe under the podium? Elektra is performed in concert relatively frequently, and for good reason. (So is Salome, for the same reasons.) Strauss’s scores showcase a major orchestra and conductor to thrilling and very loud effect. It also has a drama whose decadent horrors—particularly the constant invocations of bodily decay and disease in Hofmannsthal’s libretto—can effectively be left to the imagination of the listener, an approach sometimes superior to the inevitable disappointment of ratty costumes and a dim unit set of suspiciously styrofoam rocks. Productions of Elektra almost end up as screaming, over-the-top camp extravaganzas. And despite its comparatively minimalist visuals, this concert presentation with the Boston Symphony Orchestra was actually no exception! I mean that, however, in the best possible way. Andris Nelsons and Christine Goerke made the kind of epic, high octane, extremely loud, occasionally touching opera that you don’t see nearly often enough. It’s the kind of excess that works because it’s done with utter conviction. Even though there was no set, this was not an Elektra that left everything to the imagination. None of the singers used scores and it would be more accurate to call it semi-semi-staged. In the first scene, when Elektra glowers at the maids without saying anything, there’s no musical reason for her to appear onstage—and yet there she was, loitering between the first and second violins. Most of the stage directions were present in so much as to make the text intelligible—Chrysothemis raises her hands before Elektra asks her why she is doing so, and, yes, the performance ended with a fine stomping Elektra dance. There was, however, no axe, and the Fifth Maid escaped Maids #1-4 unscathed. The center of the performance was Christine Goerke’s formidable Elektra. Wearing a tomato-red dress, she made Elektra crazed from the very beginning. Fortunately she has the vocal goods to back this up, singing with a huge, rich middle and lower voice. She doesn’t just sing this score tirelessly but also musically! The ending of the Recognition Scene, the moment of some of the role’s most lyrical writing, was both expressive and sung with a beautiful legato line. Her top notes are not as large as the rest of the voice but nonetheless have a piercing intensity. It’s a performance that embraces the tradition of demented excess. When you start the opera at 11 you arguably don’t have anywhere to go but Goerke has the resources to sustain and vary that intensity for the whole opera. Her moments of sanity tended to be snarky: her asides to lovelorn Chrysothemis, some of her comments to her mother. At times, however, I wondered what a more internalized portrayal would look like, probably because I watched the Chéreau production on DVD (the one that is soon coming to the Met) before this performance. Without going into detail about that, it made Goerke’s approach seem a little Ryan Murphy, a little gothic. But commenting that Elektra is too much probably means that Elektra is not your thing. As Chrysothemis, Gun-Brit Barkmin had a vibrant way with the text and the clearest diction in the cast. I could understand all the words and they sounded unusually spontaneous. Her voice is lean, focused, and pretty big, but I would have preferred more warmth and plushness in the sound in this particular role. Her top notes sound squeezed rather than open, and the end of her opening monologue didn’t really quite come off as it should. She is a striking performer (and her 1920s outfit was fabulous) but I don’t think it’s a beautiful voice. As Klytämnestra, Jane Henschel was powerful, but sometimes her singing seemed more a collection of special effects–growls, whispers, sudden breaks into the upper register–than an organically coherent performance. Her Klytämnestra was a relatively by the books madwoman, effective but not as convincingly original. On the male side, Gerhard Siegel made a vivid cameo as Aegisth, establishing an oily character in no time and then vanishing almost as quickly. (Longtime comprimario all star Mark Schowalter did something similar in the even shorter role of the Young Servant.) In the longer role of Orest, James Rutherford got off to a nice, deep, Wagnerian sort of start but failed to build through the Recognition Scene as Goerke ran off with it. The gaggle of maids was solid and I was impressed by Mary Phillips as #3 (I don’t know the score that well but they were helpfully lined up in numerical order) and I happy to see and hear Nadine Secunde as the Overseer. But the other major star of the performance was, of course, Nelsons and the orchestra. He is a major conductor and this was very exciting, tense conducting, perfectly milked at the climaxes and not afraid of the crunchier moments. He can get real texture in the intimate moments, notably the fluttering winds in Klytämnestra’s monologue. The brass sounded terrific, but I do think there’s a missing ingredient from Nelsons and the orchestra’s Straussian recipe: something about the strings. They were there and they were doing their thing, but Nelsons’ Strauss is almost all glower and no glow. That radiance has to peek out occasionally, and it’s usually in the violins. Perhaps this is because I still have the sound of the Wiener Staatsoper faintly in my ears, but I wish he had found more of those moments that gives some light to this violent score. 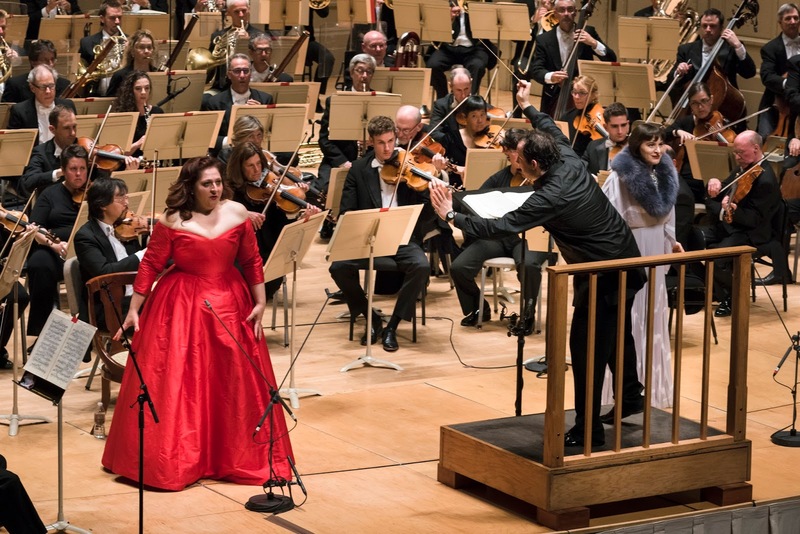 Nelsons and co. repeat this Elektra tonight in Boston and in New York next week and you absolutely need to see if it you can. The Met’s Elektra this spring is going to be very different. And did anyone else notice this YNS Elektra later this fall? Hmm. I have to say that I was slightly underwhelmed by Georke's Die Frau performances than others were. I appreciated her musicality and her down to earth approach in a role than can sometimes be irritating, but I thought the actual voice itself was very tense and bottled up (similar to what I hear in Joyce Didonato's, although that's obviously where the similarities end) and that her acting was lacking in some intensity. I thought that Schwanewilms, though not ideal either, was considerably more interesting and sang with more straussian beauty. This summer I saw Evelyn Herlitzius sing Elektra with Pieczonka and Meier and I have to say that while I often dislike Herlitzius (I think her La Scala ortrud was abominable) she was phenomenal and I find it annoying that she wasn't brought along with the rest of the chereau cast to new York. Since this post is about Strauss, I'll add that I just returned from a performance of Ariadne auf Naxos at the Royal Opera House which was hands down the most amazing performance of this opera I've seen live. SUPERBLY cast across the board (very rare in this opera), with the most beautiful trio of nymphs I have EVER heard, both live and on records. Karen Cargill in particular was amazing. A classy and elegant Christof Loy production to boot, perhaps on par with the magnificent Carsen production (and with better revival direction)and lagging behind the Guth production only by a little. I wonder if the Royal Opera House gives more rehearsal time to revivals than the average opera house? Based on this performance and the revival of Figaro that I attended (opening night) the level of detail in the personenregie is of far higher quality than the average revivals in other major opera houses (Munich, Vienna especially, and the Met). Mattila was better than I had any hope of expecting. I could go on about her extraordinary dramatic abilities (for someone who I’ve heard described as fidgety, her moments of stillness were breathtaking) but I’ll say this instead. She SOUNDED spectacular. Not as in spectacular “for her age” or “after weathering a huge vocal cross etc…” But just spectacular. No concessions had to be made at all. Even the high notes were consistently rock solid and secure with minimal effort, something that hasn’t been the case in a VERY long time.